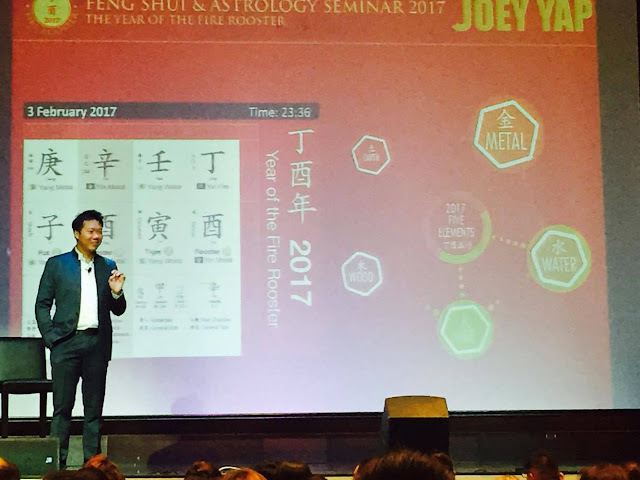 Dato Joey Yap, the World's Best Feng Shui Expert successfully conducted his annual Chinese New Year Seminar at the Grand Ballroom of Marriott Hotel Manila. Aside Year of The Rooster Forecast, the participants also learned some Feng Shui tips and basic Face Reading. The event was sponsored by Resorts World Manila. The coming year will bring a time to increase your wealth as there will be professional opportunities or investment offers which will significantly boost your income. The presence of helpful people at your hour of need will also greatly improve your successes in the endeavors you set out to do. As such, any issues will not likely have a major impact as these individuals will help you shoulder them if not solve them for you. Despite the generally favorable outlook, things may not entirely be pleasant at home as there will be an increased likelihood of domestic disputes occurring. This may in turn negatively affect your mental well-being. It may be to your advantage to keep a clear line of communication with family members. You will not be short on opportunities in 2017 in addition to the ever-available assistance whenever you need it the most. To sweeten the deal, one of these opportunities may turn to be something significant in the form of a job offer or a business opportunity. Nevertheless, you may want to think things over thoroughly before committing to a decision. It would be of utmost importance that you do not involve any large amount of money in any of your dealings this year. Your good fortune this year may also provoke envious individuals who might work to sabotage and derail you. This in turn may leave you feeling isolated and distressed as you would not know who to trust. It would pay for you to be extra careful this year due to an increased likelihood of accidents and financial loss. Every decision you choose to take should be thought out carefully before being committed to action, failing which may result to disastrous implications. The possibility of a major loss of some sort may also leave you emotionally drained. Despite this, you should not let any negativity affect you as with the right motivation, there will be chances for you to reverse a bad situation and turn it into an advantage. By keeping an open mind, you may even capture an opportunity to travel which may in turn become profitable financial gain. 2017 will be a relatively smooth-sailing year for you as long as you are able to navigate the rougher parts and grab opportunities as they come by. When the latter appears, ensure you make the most out of it. Prospects to improve your career and personal life may prove to be more beneficial than they seem as they will have a significant positive impact on your life in the long run. While you can expect some happy occasions this year, you may need to be wary of people around you as some may be troublemakers and is out to make things difficult for you by causing disputes and arguments. For personalized Astrology Reading or Feng Shui consultation for your home or office, you may email Resti H. Santiago at: resti.astrologer@gmail.com Resti has been practicing Western Astrology since the 1990's. He also studied Feng Shui, Grow Rich with Bazi, and Qi Men Dun Jia- Getting What You Want Module from Joey Yap's Mastery Academy of Chinese Metaphysics.